The search for the sun and signs of spring weather are a recurring theme of this blog, mainly because of my personal dislike of the cold. Because of this bias I grasp for any hint of the warm weather to come. The first and earliest sign of the coming spring is when the birds begin to fly south. Yes, I said fly south. The birds I’m talking about are Blue Jays, Cardinals and Orioles — Baltimore Orioles. The teams of Major League Baseball begin to report to spring training on February 13th, that’s 33 days from the day this blog is posted. The state of Florida will be descended upon by fans ready to witness their own version of the great migration, as the American League’s Grapefruit League starts up and big names play ball in small stadiums. 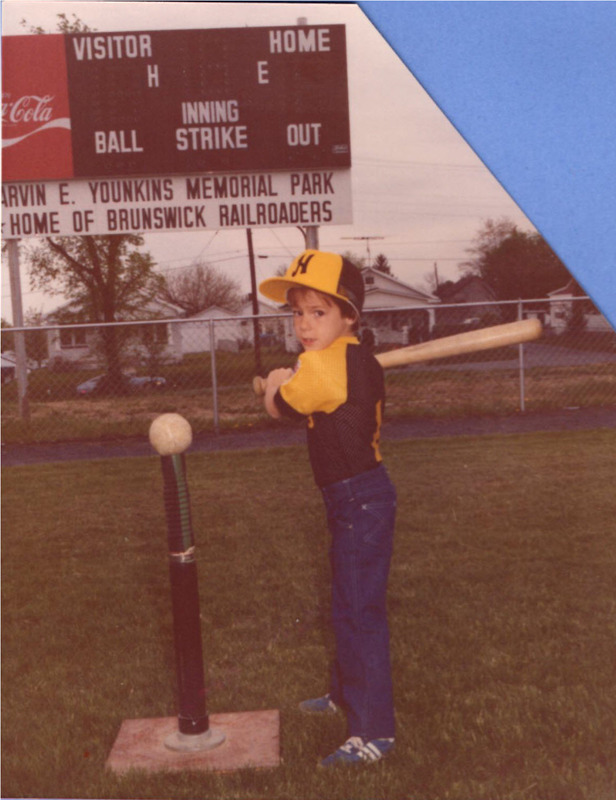 A young Zeke at the plate. If you’re a fan of America’s pastime (yes, Amanda, it’s baseball, not football), here are some hints on where to go for some bird watching (or pirate watching or tiger watching or men-wearing-pinstripe-suits-and-playing-in-the-dirt watching). The first games start Wednesday, February 26th, with the Yankees vs. Pittsburgh in Bradenton, Florida at McKechnie Field. The stadium holds just under 8,500 spectators and that makes every seat close to the field. You won’t find yourself sitting in the nosebleed section; there isn’t one. You should easily be able to see that “dreamy” Derek Jeter (at least according to my sister and mother) play short stop up close. Here’s the plan to get all the up close you can while on your baseball bender. I’m using the Orioles’ schedule, but you can substitute your favorite team. I’m assuming you’re staying in Sarasota to be near the home team. You can check into a La Quinta Inn & Suites on March 1st and out on the 6th for about $129 per night for a total of $645 for five nights. Why five nights? My goal is 5 games in five days. I suggest getting a rental car since all five games are within 1 hour and 10 minutes of Sarasota, which will cost you around $434 for a week. The first game is on home turf at Ed Smith Stadium in Sarasota versus the Toronto Blue Jays on March 1st. Tickets are $16. The second game is March 2nd, 1 hour and 10 minutes away versus the Boston Red Sox in Fort Myers. Tickets range from $52 for seats,$44 for bleachers and $35 for lawn seats. The next game is back at home in Sarasota (back to $16 tickets) before hitting the road for the hour drive to Tampa versus the Yankees, tickets: $24.00. You finish out your trip on the road back in Fort Myers this time versus the Twins: tickets $20.00. If you need a complete schedule of the action for the Orioles check out the official Baltimore Orioles site. If you have a favorite team other than the O’s check out the Florida’s Grapefruit League site for information and links for the American League spring training schedule. You can also follow the league on twitter at @FlaSpringTrain. Oh, and Dad if you’re reading this, round trip from Baltimore is $530 for two.